Flower mandalas come in many forms. Some are designed with one flower whose center is the focus of the mandala and its petals radiate outward. Others contain multiple images of flowers in a variety of colors, shapes and sizes. While some are artistic replications of flowers, others are digital designs using a real photo of the flower as the base of the mandala. The flower of life mandala consists of a series of overlapping circles that form flowers throughout the mandala. This mandala is also referred to a sacred geometry and is thought to bring spiritual enlightenment. What Do Flower Mandalas Mean? Where Do You Find Flower Mandalas? Flower mandalas may be found in artwork, storybooks, in digital media, on nature sites, and in magazines. They may adorn clothing, bags, scarves and other accessories for ornamental value. They may also be found in coloring books for either adults or children. Modern flower mandalas created from fractals in digital software can be found in art shows, framed for sale and on note cards. You can even use flower mandalas as a tattoo design. How are Flower Mandalas Used? Flower mandalas can be used in meditation to focus attention and manifest personal or spiritual growth, displayed as art or used in coloring books as a form of entertainment or relaxation. They allow ample room for creativity as individual flowers or flower parts can be colored in any hue to create the effect you desire. Colored mandalas make excellent gifts and can be tailored to meet the recipient’s taste or coordinated to match home décor. How Do You Know the Meaning of a Flower Mandala? White Rose – This delicate flower is often associated with love but the white rose symbolizes spiritual awakening. When used in meditation a white rose will lead you to a higher level of consciousness or spirituality. Pink Dahlia – The pink dahlia represents the concept of self-love. Using this flower mandala for meditation will lead to a deeper sense of self-love which will expand to other areas of your life. White Lily – The white lily flower mandala symbolizes choice. Meditating on this mandala brings about a deeper understanding of your choices in life and helps you make the right decisions. Blue Morning Glory – The beautiful blue morning glory mandala represents grace. In meditation it brings a sense of peace and spiritual growth. Orange Marigold – The orange marigold mandala represents timing. It can be used in meditation to enhance your sense of timing or enhance your ability to intuitively understand the correct time to take action. Red Begonia – The red begonia mandala promotes balance in your life. White or Yellow Daffodil – Daffodil mandalas represent hope. In meditation, this mandala brings strength and allows you to view the world in a positive light. Dandelion Head – The dandelion head symbolizes courage and is useful when you are feeling hesitant in life or are facing changes that requires faith and courage. Lotus Flower – Lotus flower mandalas represent enlightenment. Meditating on a lotus flower mandala promotes spiritual enlightenment and growth. Some artists, like Kathy Klein, create temporary mandalas from flower petals and plant parts to decorate outdoor areas. Kathy refers to her mandalas as danmalas, the Sanskrit word for ‘giver of garlands’. 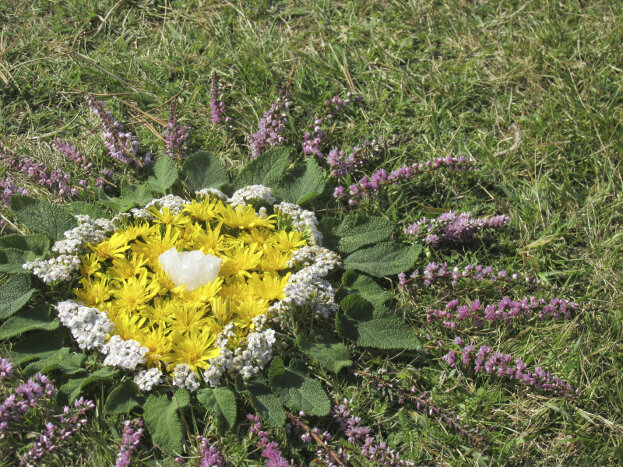 This type of mandala makes a enjoyable outdoor activity for children (and adults) and is well suited for adorning fairy gardens. 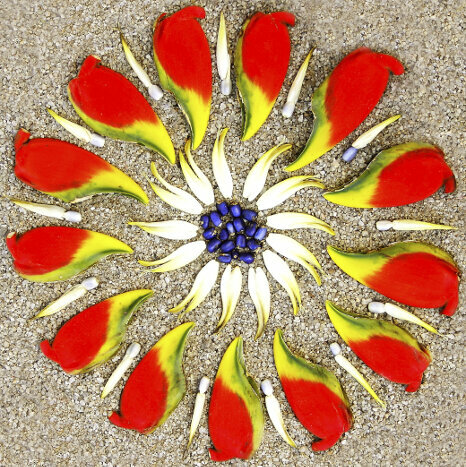 Try making a danmala from wildflowers and shells the next time you visit the beach or spend a leisurely day in nature.